Undertaking a kitchen remodeling project can be very exciting, but it can also be very stressful. That’s why it’s important to meet with your contractor and take the time to go over these four vital factors to consider before you start. You’ll quickly learn what is and is not possible based on the size of your kitchen. When you and your designer are discussing your ideas, needs, and wants, they should be in your home mapping out exactly where everything would go so they can determine if some upgrades simply can’t fit. 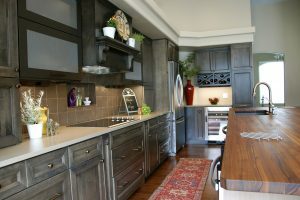 If you’re lucky, your existing layout will be able to accommodate your dream kitchen’s makeover. However, often in order to build your kitchen as you envision it, you have to remove or shift windows and non-load bearing walls, which can be very costly and time-consuming. It’s important to let your contractor determine whether that would be necessary before you start your kitchen remodeling. Now that you’ve considered your current layout, you can look to potential layouts. Popular options include L-shaped layouts that utilize corner space and only have one entry point and U-shaped layouts that foster a flow of traffic around a kitchen island. Consider how your current layout works in your home to determine if you want to replicate it or choose a new one. It’s very important for your safety and for the structural integrity of your home that you examine the room’s infrastructure. If your kitchen remodeling project has an effect on your floors, walls, and ceiling, are you prepared mentally, financially, and in regard to your project’s timeline to address these effects? The first step of any successful kitchen remodeling project is to meet with your designer and professional contractor to review your current kitchen’s size, layout, and structure to ensure that its able to support your personal vision.